Tesla on Wednesday evening announced first-quarter deliveries that fell short of expectations. Shares were down almost 9% ahead of Thursday’s opening bell, getting close to key support in the $250 area. On Thursday, a judge is set to hear oral arguments as to whether CEO Elon Musk should be held in contempt of court over a tweet that misstated the number of vehicles the electric-car maker expected to produce this year. Tesla shares were down almost 9% Thursday morning after the company’s first-quarter deliveries fell short of expectations. The electric-car maker said Wednesday evening that 63,000 vehicles were delivered in the first quarter, missing the 64,000 vehicles that analysts surveyed by Bloomberg were expecting and down 31% versus the fourth quarter. The breakdown was 50,900 Model 3 sedans and 12,100 Model S and Model X vehicles. 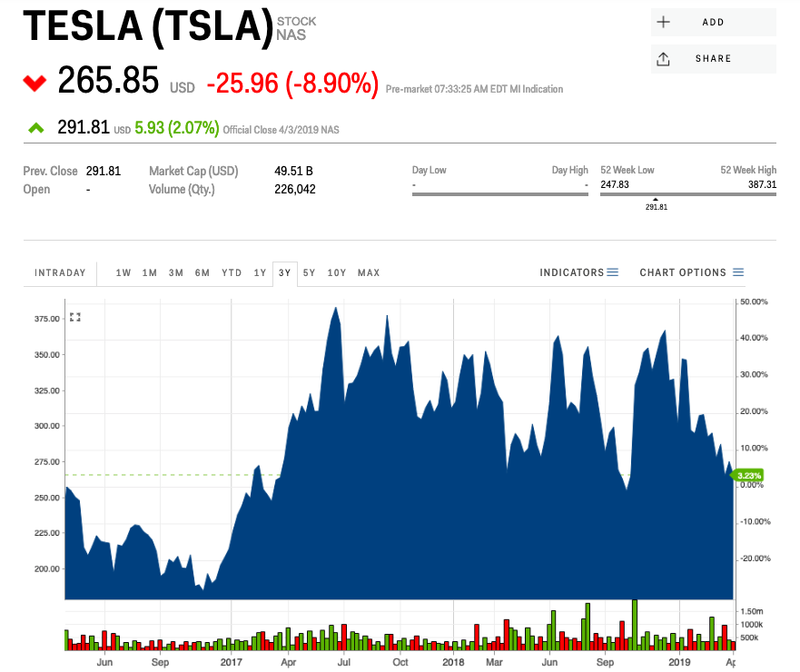 The JPMorgan analyst Ryan Brinkman put out a note titled “5 Reasons Why Tesla’s 1Q Deliveries Report Is So Negative” and slashed his price target to $200 a share from $215. The negative reaction from Wall Street put pressure on Tesla shares, sending them below the $270 mark ahead of Thursday’s opening bell. Traders will now be watching the $250 support closely, as shares have not closed below there since March 2017. It has been a hectic time for Tesla shareholders. At the end of February, the electric-car maker announced the heavily anticipated debuted of its $35,000 Model 3 sedan and said it would be shutting down most of its retail stores. Less than two weeks later, Tesla reversed its plans and said it would keep many of its stores open. And on Thursday, a judge is expected to hear oral arguments as to whether CEO Elon Musk should be held in contempt of court for a tweet that misstated the number of vehicles the company expected to produce this year. Public filings showed Tesla expected to produce about 400,000. Next In 2010, the U.S. Air Force used over a thousand game consoles to build a supercomputer… which one?